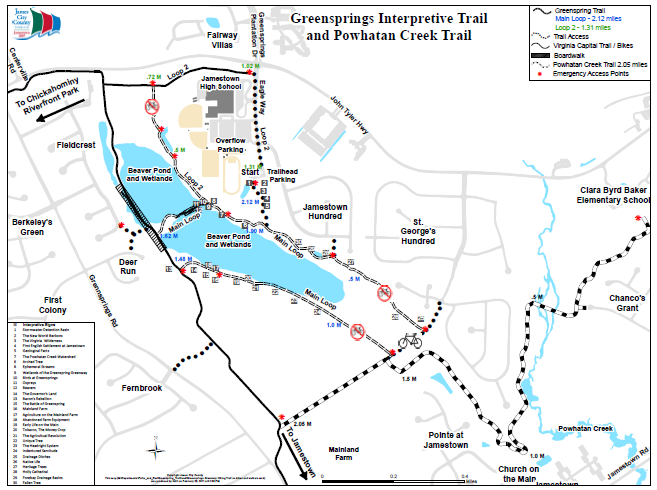 Wander along this 3.5-mile nature trail that loops through a landscape of beaver ponds, wetlands and forests Popular with residents of the surrounding neighborhoods, Greensprings Greenway is equally inviting to after-work joggers and out-of-town history buffs. Interpretive signs highlight the ecosystem that English colonists found here and the centuries of agrarian heritage they established, as well as the Revolutionary War Battle of Green Springs. Aside perhaps from the auspiciously named Jamestown High, the suburban surroundings of Greensprings Greenway belie the area’s historic significance. The trail encircles a beaver pond where snowy egrets and red-headed woodpeckers nest. Virginia’s earliest English colonists might have happened upon similar sights when first venturing beyond their haven at Jamestown Island, 2 miles to the south. In exploring the woodlands north of the James River, the colonists had agrarian ambitions foremost in mind. Their charge was to produce crops for export (they soon settled on tobacco). Bordering the trail to the south is Mainland Farm, the oldest continuously cultivated farm in America. Over 200 species of birds have been documented on this site and it is part of the Virginia Birding Trail. The trail is open daily from 8 a.m. to sunset.